117. ST. PETER, Handsworth (Grove Lane), a brick building in the Gothic style designed by F. B. Osborn, and comprising chancel, nave, and transepts, was consecrated in 1907. 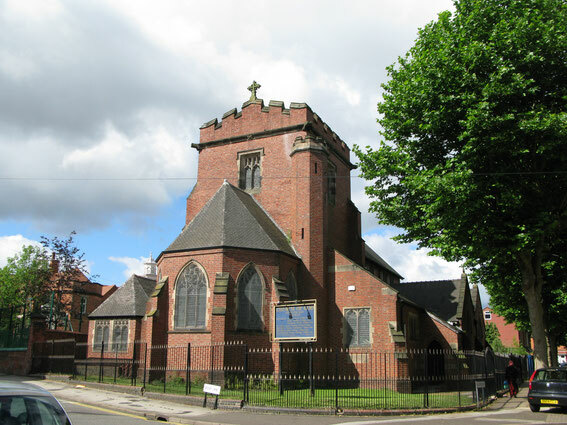 In the same year a parish was assigned to it out of St. James's, Handsworth, and St. Michael's, Handsworth, the living being a vicarage in the gift of the bishop. St Peter’s Church, Handsworth is a Grade II listed former Church of England parish church in Birmingham now used by a Church of God (Seventh Day) congregation. Historic England website - https://historicengland.org.uk/listing/the-list/list-entry/1075557. See also the Church Plans Online website for Chatwin's original plan for the church - http://images.lambethpalacelibrary.org.uk/luna/servlet/detail/LPLIBLPL~34~34~150986~120925?sort=identifier%2Cdate%2Ctitle%2Crights&qvq=q:chatwin;sort:identifier%2Cdate%2Ctitle%2Crights;lc:LPLIBLPL~34~34&mi=12&trs=15.